The Senate voted to confirm Andrew Wheeler, a former lobbyist for Murray Energy. If Administrator Scott Pruitt leaves, Wheeler would become interim head of the EPA. Editor's note: Andrew Wheeler is now set to become acting EPA administrator following Administrator Scott Pruitt's resignation on July 5 amid scandals. Former coal industry lobbyist Andrew Wheeler was confirmed Thursday as the No. 2 official at the U.S. Environmental Protection Agency, putting him in line to take interim charge of the agency if Administrator Scott Pruitt is toppled by his ethical missteps. The Senate voted 53-45 in favor of Wheeler's nomination to be deputy EPA administrator, after a final salvo of floor speeches in which Democrats spotlighted Pruitt's scandals and Wheeler's potential conflicts. With two fossil fuel-state Democrats—Sens. Heidi Heitkamp of North Dakota and Joe Manchin of West Virginia—joining the GOP in supporting his nomination, Wheeler had the simple majority needed for confirmation. Both senators face tough re-election battles this year in states that Trump won. Another Democrat facing a tough re-election battle, Sen. Joe Donnelly of Indiana, also voted to approve Wheeler's nomination. Wheeler served until last year as top lobbyist to Murray Energy, the nation's largest underground mining company. Administration critics argue that the company's CEO, Bob Murray, one of President Donald Trump's most avid campaign supporters in the fossil fuel industry, has undue influence with the administration; Trump's team already has checked off a number of the items on a deregulatory "action plan" Murray submitted to the White House soon after Trump's inauguration. Sen. Tom Carper (D-Del. ), the highest ranking Democrat on the Senate Environment and Public Works Committee, has said that Wheeler privately told him he did not write the action plan. Carper also said Wheeler assured him that he views EPA's legal authority to regulate greenhouse gas emissions, which is based on the agency's "endangerment finding," to be settled law—which would be a stark contrast from Murray, who not only thinks it should be repealed, but argues that carbon dioxide is not a pollutant. But Wheeler clearly helped Murray Energy make its case in the early days of the Trump administration. 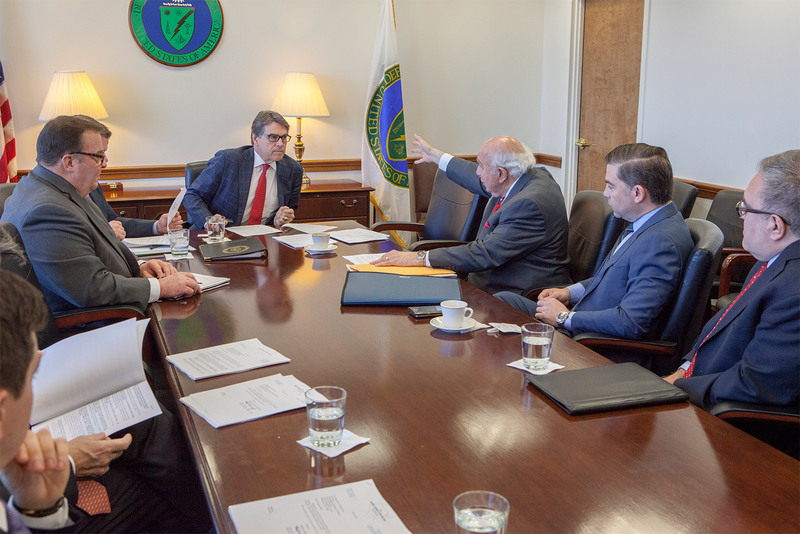 He was photographed sitting at a conference table with Murray and Energy Secretary Rick Perry on March 29, 2017. When questioned by senators last year about his own views on climate change, Wheeler stuck to one of the scripts that Trump officials have favored to sidestep outright denial, while understating the agreement among mainstream scientists and the urgency of the issue. "I believe that man has an impact on the climate, but it's not completely understood what that impact is," Wheeler said at a hearing last November. Prior to his work as a lobbyist, Wheeler was a top aide to one of Congress's most prominent climate science deniers, Sen. James Inhofe (R-Okla.). He served Inhofe as a personal staff member for two years and then as a committee staff member for 12 years, including as chief counsel for the Environment and Public Works Committee while Inhofe was chair. Inhofe praised Wheeler for his work on bipartisan legislative accomplishments, including the energy bills of 2005 and 2007, which increased vehicle fuel efficiency standards and promoted use of ethanol and energy efficiency. Wheeler also has prior experience at EPA; before joining Inhofe, he served for four years as a special assistant in the Office of Pollution Prevention and Toxics. But Wheeler, nominated by Trump on Oct. 5, was one of dozens of nominees whose names have languished for weeks. Marc Short, the president's legislative affairs director, took time out of the daily White House press briefing last month to blame "historic obstruction ... by Senator Schumer and Senate Democrats" for the delay in approval of Wheeler and other nominees. The delay was not unprecedented, however. The last deputy EPA administrator of President Barack Obama's administration, career agency official Stan Meiburg, served in an acting role for more than two years because the Senate did not act on his nomination, which Inhofe opposed. The EPA deputy administrator serves as the agency's chief operating officer. "You pay a lot of attention to the basic running of the shop, oversight of the budget, financial operations, personnel, information systems ... and generally trying to maintain internal operations needed for a healthy agency," said Meiburg, now director of graduate programs in sustainability at Wake Forest University. Wheeler will walk into an agency under siege over Pruitt's spending on travel and security, his handling of personnel matters, and the potential conflicts of interest he created with a $50-a-night condo rental from the wife of an energy lobbyist. House Oversight Committee Chairman Trey Gowdy (R-S.C.), on Wednesday fired off a letter saying that EPA had not provided his committee with requested information on Pruitt's first-class travel arrangements or his Capitol Hill lease. EPA's inspector general is looking into Pruitt's spending—amounting to more than $3 million, according to documents reviewed by the Associated Press. The Office of Government Ethics also weighed in with a letter to EPA's general counsel's office, focusing on what it said were "extremely concerning" reports of the agency's demotion and reassignment of staff members who challenged Pruitt. But Pruitt's aggressive actions to weaken, delay and repeal environmental protections, and to remake the EPA's use of science have won him supporters who count. Trump so far has stood by Pruitt, saying in "coal and energy country ... they love Scott Pruitt." But other White House officials are reportedly exasperated by the EPA administrator's troubles. Sen. Susan Collins (R-Maine), the only Republican to vote against Pruitt when he was confirmed last year, said that the "drip-drip" of scandal has vindicated her position that he is the wrong person to head the agency. On Thursday, Collins voted "yes" on Wheeler's nomination. Senate Democrats didn't allow Wheeler's nomination to reach a final vote without venting their concerns over the agency's direction. Gene Karpinski, president of the League of Conservation Voters, noted in a letter to senators that Wheeler never received his own confirmation hearing. Instead, his hearing was shared with Trump's doomed nominee to head the White House Council for Environmental Quality, Kathleen Hartnett White. White, an outspoken fossil fuels advocate, later withdrew from consideration. Karpinski said Wheeler's "long history of ties to the fossil fuel industry make him an entirely inappropriate choice" as deputy administrator at EPA. "Wheeler did not get a standalone hearing, where his ties to the fossil fuel industry could have been properly vetted," he said. "He's never been vetted to be [in] the top job. So we've got a real problem there," Sen. Tom Udall (D-N.M.) the highest-ranking Democrat on the committee responsible for EPA's appropriations, said at a news conference Wednesday. "What's happening is we could see Scott Pruitt leave in a matter of days. ... I know that there are many Republicans who haven't spoken out yet, but privately they are very disturbed at what Scott Pruitt is doing at EPA." Udall took to the Senate floor to push for a further examination of Wheeler, and a half-dozen other Democrats also voiced their opposition. (Sen. Sheldon Whitehouse of Rhode Island said Pruitt and Wheeler would make a "dangerous duo" at the EPA.) But after a preliminary vote on Thursday showed that no Republicans would oppose the nomination, opponents took far less than the 30 hours of discussion permitted before the vote was called. "There are limited tools [Wheeler's opponents] have," said Jeremy Symons, vice president for political affairs at the Environmental Defense Fund. Symons noted that Wheeler pledged in the ethics letter he submitted after his nomination that he will refrain for one year from participating in matters concerning his lobbying clients—even though Trump, by executive order, has required a two-year ban. Wheeler could obtain a waiver of that requirement, but says Symons: "What does that say about the Trump ethics pledge if the whole thing is tossed overboard because they want a coal lobbyist to be at the EPA, where he can give favors to the industry?"